I spent the last couple of days with my family in Stowe. It is a great place for what you might call a “staycation” as it is less than an hour away. We stayed at Trapp Family Lodge, as they have a special rate for Vermonters if you make a reservation close enough to your stay. We swam in the indoor pool and skied up to the rustic cabin (hot chocolate and soup on offer if you bring some cash) and sat by the fire and played games. It was a fine time. On the way up we stopped in Waterbury–pulled off at Gregg Hill Road. We were looking for the Northern Hawk Owl. My daughter and I had stopped at the same spot a couple of weeks ago, looking for the same bird. We were out of luck that first time. And we were out of luck the second time. Bummer. The Northern Hawk Owl doesn’t usually hang out this far south. They are generally Canadians, hanging out in open spruce woods. Occasionally, however, one of them takes a southern vacation. The temperature has been right I suppose. It was three degrees when we woke up this morning. That has been pretty typical this year. 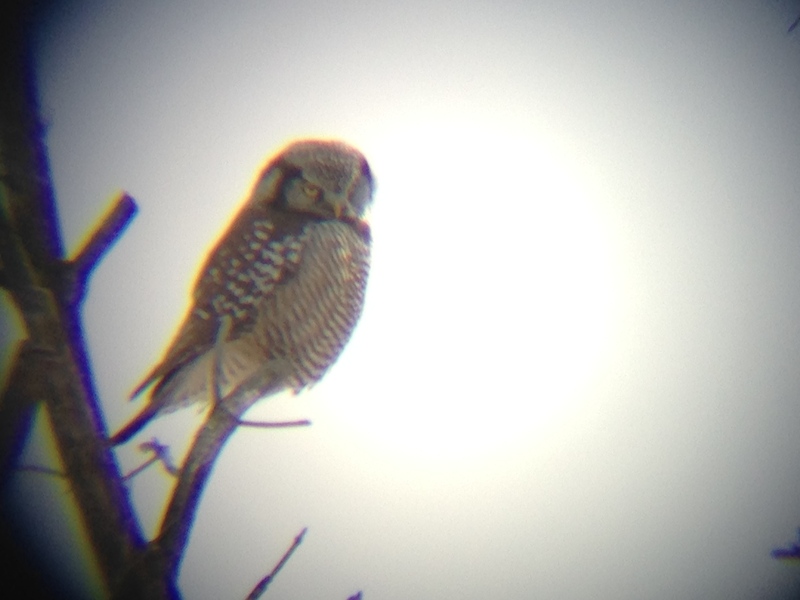 This whole week will be cold so the hawk owl might stick around for a bit yet. This owl has been around since December. WCAX reported on it in December and the Burlington Free Press just had an article on it. Lots of people have seen it as reported on eBird and elsewhere. I wanted to see it. There was a hawk owl hanging around Vermont, in Waterbury even, ten years ago. They are not common in these parts and the chance won’t likely come again soon. I really wanted my daughter to see it. It is something she would probably remember for a long time. It was too bad that didn’t work out. “Not that big,” I told her. “Smaller than a Barred Owl but pretty good-sized.” She has seen Barred Owls often enough to have a sense of their size. And it was. It was kind enough to hang out long enough for us to look through binoculars and then a more powerful scope to check it out. It is a cool creature. It has the head of an owl but the body of a hawk, hence the not-so-original name. Awesome to see, and we all got to see it well. It was great way to end our trip over the mountains. I may get a chance to see it again but I won’t count on it. By the time I get around to heading back that way again it will likely have headed back north. But maybe. Tomorrow morning I will look for another rare bird. A Tufted Duck, over from Europe, has been spotted several times on Lake Champlain. I am hoping to spot that one. I won’t hold my breath, as they say, but I’m feeling lucky. This entry was posted in birds, family, Nature, Winter and tagged bird, Birding, hawk owl, owl, staycation, stowe, trapp family, waterbury. Bookmark the permalink.